At the start of my second year of graduate studies at Harvard University, I went to the office of the Director of Graduate Studies (who was then the noted psychologist Gordon Allport) to find out if I had been awarded a teaching fellowship. “yes!” answered his secretary, “I have good news and bad news for you.” She continued: “the good news is that you have indeed been given a teaching fellowship. The bad news is you will be assisting Professor Sorokin this fall.” This was in September 1953. 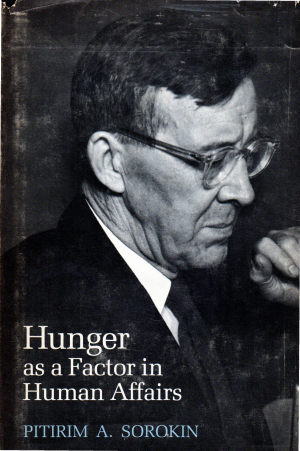 After WWII, Pitirim Sorokin was relegated to teach only undergraduate studies, considered “out of date”, and except for a perfunctory single meeting with incoming students, he was studiously avoided by graduate students. We all knew about bad feelings between him and the Chairman of the new Department of Social Relations, Talcott Parsons. To skip the details, after becoming his teaching fellow, I discovered what a great thinker and warm personality he was. Later on that semester, he invited my new bride and myself to visit him and his wife Elena at their Winchester home. This was a great honor for a graduate student. I still remember standing at his door nervously. The door opened with a smiling couple inside. Sorokin said, “Come in, come in and have a glass of champagne!”. He must have seen my perplexed look, and understood immediately, “Well, one must have the best of sensate culture!”. From then on until his death, we became close friends, and he appreciated the festschrift I organized in his honor when I was still an assistant professor at Princeton. That appeared in 1963 as “Sociological Theory, Values, and Sociocultural Change”, and I am delighted that 50 years later, it will be reissued by Transaction Publishers. On a more sober note, if Sorokin felt bitter toward Parsons (who was also my thesis advisor, which put me in a difficult position), I think that besides some intellectual differences, there was a deep hurt involved. Sorokin had started the department of sociology in 1931, and attracted some of the brightest young minds in the profession, including Robert Merton (the best student he ever had, Sorokin told me once when I asked him). But before the end of the decade, they had moved from Sorokin to Parsons. Why? Both were towering intellects, the best two theorists of the 20th century. As I reflect from personal contacts with both, Sorokin was brought up in the continental culture of the person with the encyclopedic knowledge gathered after prolonged study, and who lectures to a spell-bound audience. It is a privilege to hear him, but the audience is essentially a passive, appreciative audience. Parsons was trained in the American tradition of a seminar, where the intellectual leader interacts with students, giving them a sense of being proactive, not just reactive. That, I think, is why the top students in the department in the 1930s had “defected” and that caused pain to Sorokin and his bitterness to Parsons. In the presence of Sorokin, I felt I had very little to contribute that he did not already know; in the presence of Parsons, I felt that if I said something novel, that he had not thought about, that he would accept it willingly and try to incorporate it in his complex theoretical system. I have had my feet in both American and continental traditions, and so could appreciate being a student of both.